Note from Daily Trade Alert: Last week we launched a new regular column here at Daily Trade Alert called High-Yield Trade of the Week. The goal of this column is to show our readers how to safely boost their income from some of the best stocks in the world. It’s our sincere hope that you benefit from this new service. Several years ago, when my wife and I lived in Austin, Texas, we went in on a rental property with my parents. It was a small condo located perfectly between downtown, the University of Texas, Lake Austin and Lady Bird Lake. Up until we sold it in May, it was a nice income investment. We originally paid around $125,000 for the condo and last rented it out at $1,395 per month. After property taxes, homeowner association fees and insurance, we were collecting about an 8% annual yield on our original investment. Earlier this year we decided to remodel the condo (we put in about $20,000) before ultimately selling it for $225,000. So overall, it was a nice high-yield investment that provided a decent capital gain. I’m sure that if we held onto it, the property’s value would continue to climb, and our annual yield-on-cost would follow in lock step. Austin is booming. So why did we sell? Because managing an income property is nothing like managing an income portfolio. Managing an income property can take a lot of time and work. And in any given year, your revenue (rent) is likely capped at whatever amount is stated in the lease agreement. But your expenses are potentially unlimited. Things can break, leak, need fixing, or need replacing at any time. Property taxes can increase, your insurance premiums can go up, and if you’re a part of a homeowner association, your monthly fees can be hiked at any time. In short, your net income can be unpredictably lower any given month. My income stock portfolio, on the other hand, requires almost no effort on my part. In addition, I don’t have to deal with any unexpected future costs: I buy the shares once, hold them, and collect dividend income like clockwork. Even better, this predictable income stream actually grows each year. This is why dividend growth investing is such an attractive strategy. Your investments pay you a passive, predictable, growing income stream. The biggest problem that many people have with this strategy is that it requires time. If you’re in this boat, and you need high income today, then I encourage you to consider a strategy I’ve been using in my own personal retirement portfolio. It regularly pays 10%-plus annualized income from some of the best companies in the world. With all of this in mind, allow me to introduce you to this week’s High-Yield Trade of the Week— a trade with one of the highest-quality companies in the world, and one that could pay you 18.1% to 33.9% in annualized income. As an investment, Disney meets all my criteria: It’s a high-quality dividend growth stock that appears to be trading below fair value. 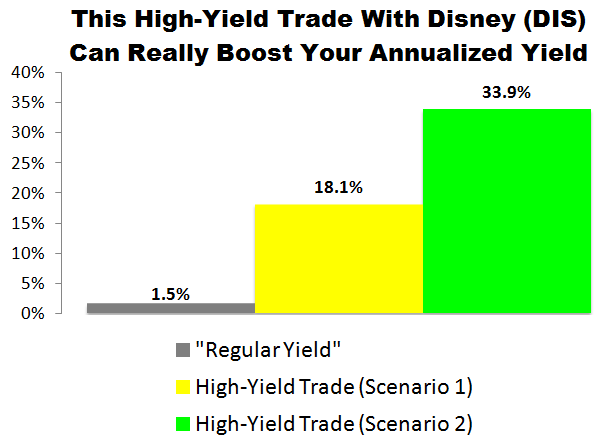 Because of Disney’s fast-growing dividend and reasonable valuation, I think long-term investors could do well buying at today’s market price, holding for the long-term, and reinvesting dividends along the way. However, for those looking for high current income, forget it. Shares yield just 1.5%. You see, by selling a covered call on these very same shares, we can boost our income significantly — generating an annualized yield of 18.1% to 33.9%. That’s at least 12x the stock’s “normal” income! As we go to press, DIS is selling for $103.13 per share and the August 18 $105.00 calls are going for about $2.15 per share. By selling a call option, we would be giving the buyer of the option the right, but not the obligation, to purchase our 100 shares at $105.00 per share (the “strike” price) anytime before August 18 (the contract “expiration” date). In exchange for that opportunity, the buyer of the option would be paying us $2.15 per share (the “premium”). If DIS stays under $105.00 by August 18 our options contract would expire and we’d get to keep our 100 shares. In the process, we’d receive $215 in premium ($2.15 x 100 shares). Excluding any commissions, if “Scenario 1″ plays out, we’d receive a 2.1% yield for selling the covered call ($2.15 / $103.13) in 42 days. That works out to an 18.1% annualized yield. If DIS climbs over $105.00 by August 18 our 100 shares will get sold (“called away”) at $105.00 per share. In “Scenario 2” — like “Scenario 1” — we’d collect an instant $215 in premium ($2.15 x 100 shares) when the trade opens. We’d also generate $188 in capital gains ($1.88 x 100) when the trade closes because we’d be buying 100 shares at $103.13 and selling them at $105.00. In this scenario, excluding any commissions, we’d be looking at a $403 profit. From a percentage standpoint, this scenario would deliver an instant 2.1% yield for selling the covered call ($2.15 / $103.13) and a 1.8% return from capital gains ($1.88/ $103.13). At the end of the day, we’d be looking at a 3.9% total return in 42 days, which works out to a 33.9% annualized yield from DIS. We’d place a “Buy-Write” options order with a Net Debit price of as close to $100.98 ($103.13 – $2.15) as we can get — the lower the better. Options contracts work in 100-share blocks, so we’d have to buy at least 100 shares of Disney (DIS) for this trade. For every 100 shares we’d buy, we’d “Sell to Open” one options contract using a limit order. Accounting for the $215 in premium we’d collect, that would require a minimum investment of $10,098.